Corbner Blake (aka Cubner Francis) was born about 1823 on the Combahee, Beaufort County, SC His father’s name was Hector Blake and his mother was Peggie. Both of his parents were enslaved by Walter Blake. He worked as a bricklayer and plasterer before the war. After the war, he also farmed. He had three children before the war. While on duty in Florida on or about the winter of 1862-1863, was disabled by rheumatism. He lived with his wife, Julia, and they were both enslaved by Walter Blake on the Combahee River in Colleton County, South Carolina. They were married about 1866 (another account states about 1855) by Daniel Blake in Beaufort, SC. They had four children and three had died by the time of his deposition on 26 June 1902. One daughter, Phillis, married William Gillison. Julia died in October of 1907. On 24 April, 1908, Corbner married Hannah Frances. Hannah had been married twice before she married Corbner. Her first husband was Thomas Rivers who died in the Beaufort County poor house about three years before the storm of 1893. Her second husband was Brister Stewart who died about seven years prior to the deposition and was buried at Seabrook, SC. Corbner Blake died on 24 August 1908 and was buried in the Beaufort National Cemetery. After his death, Hannah filed for a widow’s pension. Corbner Blake served as a private and a corporal in Company F, 34th Regiment, USCT. He enlisted in 3 July 1863 and at Hilton Head, SC and was discharged on 28 February 1865 at Mt. Pleasant, SC. He was described as being 5-feet 8-1/2 inches high. His complexion and eyes were black. His hair and chin whiskers were gray. There were no visible marks or scars. Corbner Blake’s pension was approved and he was issued pension certificate #608908. He received a pension of $8.00 per month. In June of 1894, Blake filed for a pension increase under the pension act of June 27, 1890. On 15 December 1903, he filed for an increase in pension under the pension act of June 27, 1900. Summary of statement of Alfred Fripp, August 1864: He knew Corbner Blake had rheumatism all over his body while on picket duty. It compelled him to return to the hospital for treatment. He was present when Corbner became afflicted and was an eyewitness to the related facts. Summary of statement of Alfred Fripp, 12 November 1895: He was between 70 and 80 years of age. They said he was 50 when he went into the army. He served in Company H, 34th USCT under Capt. Markley. He served from 1862 to March 1866 and mustered out as a corporal. He knew Corbner Blake when Corbner belonged to Blake on the Combahee. He knew Corbner to be a supple healthy man before the service. He lived three or four miles from Corbner but knew him off and on. Alfred Fripp’s owner was Dr. Cuthbert. Alfred joined the army before Corbner. He knew Corbner served as Corbner Blake and was a corporal in Company F. He knew him well in the service and would meet him at the doctor’s occasionally. He knew Corbner to be a good soldier and that he was not sick much except for occasional fevers and a little pain. They mustered out together and Alfred returned to his family in Jacksonville, FL. He stayed there for nine months and then moved back to SC. He has lived near Corbner ever since, seeing him every day. Corbner Francis is the identical man who served in Capt. Adams’ company under the name of Corbner Black. He knew Corbner to be all right for some time after he mustered out. He was able to attend to his farm and support his family for years. For the ten or 15 years prior to his deposition, he had noticed Corbner suffering more than he had been. He said Corbner was often laid up and could only limp around. His shoulders and hips were what he mostly complained about and he was afflicted by rheumatism. Summary of statement of Warley Hamilton, 1 August 1864: He knew Corbner Blake to be affected by rheumatism in his whole body that compelled him to return to the hospital and seek relief. He knew Corbner Blake was on picket duty at the time and had to be relieved immediately by doctor’s orders. Summary of statement of Warley Hamilton, 1865: Warley Hamilton stated that Corbner Blake’s rheumatism was caused by exposure on the battlefield and in the camps. Corbner Blake had been attended to by Capt. Adams in the hospital tent but no care was effected. He was still suffering much from his ailment and was unable to do much work on his little place. He served with Corbner Blake all through the war until the disbanding in 1865. Summary of statement of Anthony Bailey, 14 November 1895: He was over 50 years of age and served as a constable for Dr. White in Beaufort, SC. He served in Company F, 34th USCT under Capt. Jno M. Adams. He mustered out with the company at Mt. Pleasant. He first knew Corbner Blake in their company and never knew him before that. Corbner was a corporal in the company. He was made corporal in Florida. He knew Corbner was “sick backwards and forwards” in the service but did not know what was wrong with him. He did not know if Corbner had been injured or wounded. He knew he was sick when he mustered out. They shipped home together and landed at Waterhouse wharf. He had seen Corbner off and on in Beaufort since their discharge. He did not know of Corbner’s complaints. Summary of statement of Daniel H. Simmons, 15 November 1895: Daniel H. Simons was about 54 or 55, a coach maker, and lived in Beaufort. He served as a private in Company F, 34th USC Infantry under Capt. Jno M. Adams. He enlisted at Beaufort, SC and mustered out at Mt. Pleasant 28 February 1866. He became adquainted with Corbner Blake in Company F and did not know him before that. Corbner Francis was the same identical man who was in Company F under the name of Corbner Blake. He and Corber were not bunk mates. He knew Corbner to be a good, ready soldier but did not know of any disability he had in the service. He did not know of any wounds or injuries incurred in the service. He had known Corbner since his discharge and had never been to his house but had seen him off and on in Beaufort. Corbner complained of pains in the body and limbs and seemed disabled when they saw each other. Daniel was not related to Corbner Blake. Summary of statement of Toby Taylor, 14 November 1895: Toby Taylor was 54 years old, a farmer. Taylor served as a private in Company F, 34th USCT under Capt. Adams. He enlisted at Beaufort and mustered out at Mt. Pleasant on 28 February 1866. He knew Corbner Blake first in the company and never before. He was Corbner Blake in the army and is the same identical man they called Corbner Francis at the time of his deposition. Corbner was the corporal in charge of Toby’s squad and put Toby on picket post many nights. He knew Corbner to be a good peaceable man who was well liked in the company and a good soldier. He knew Corbner was sick one time at Baldwin, FL on the return of the regiment from Olustee, FL. There had been a hard, severe retreat there and Corbner gave out and was laid up in camp for a time. He got all right for duty after that. He seemed all right at discharge and they went home together. For a number of years, they lived within three miles of each other. Toby said Corbner was much older than he was and had complaints of his back and rheumatism. He saw Corbner off and on and had been to his house. Corbner was unable to farm and his wife did the work assisted by the children. Toby looked on Uncle Corbner as a disabled old man. He did not know what Corbner’s affliction was in the army. He was not related to Corbner. Summary of statement of Sharper Rivers, 26 November 1895: Sharper Rivers stated that he was 49 years old and a farmer. He was also a disabled soldier. He lived on Frogmore Plantation. He was in Company F, 34th USC Infantry, enlisting in April 1863 and being discharged for disability in June 1865 at Jacksonville, FL. He knew and remembered Corbner Blake who was in his company. He had seen Corbner several times since the war ended. He knew Corbner was a corporal and was a very tall man. He never knew Corbner before meeting him in the service. He also remembered Corbner Blake to be a very quiet, peaceable man and a very good corporal. He did know remember any wounds, injuries or sickness that Corbner had in the company. He never heard Corbner complain of anything like rheumatism. He had never been to Corbner’s house after the war ended nor had he ever worked with him. He had just seen Corbner a few times in Beaufort since the war and only knew him by his army name of Blake. Summary of statement of Jack Green, 27 November 1895: Jack Green was over 70 years of age and lived five miles north of Beaufort, SC. He served in Company F, 34th USCT, enlisting at Beaufort and mustering out at Charleston, SC. He knew Corporal Corbner Blake in his company and never before enlistment. He knew Corbner well in the service but did not know of any sickness he had. He had seen Corbner off and on since muster out but had never worked with him nor lived near him. He reported Corbner to be a good corporal and soldier who was not sickly in the army. 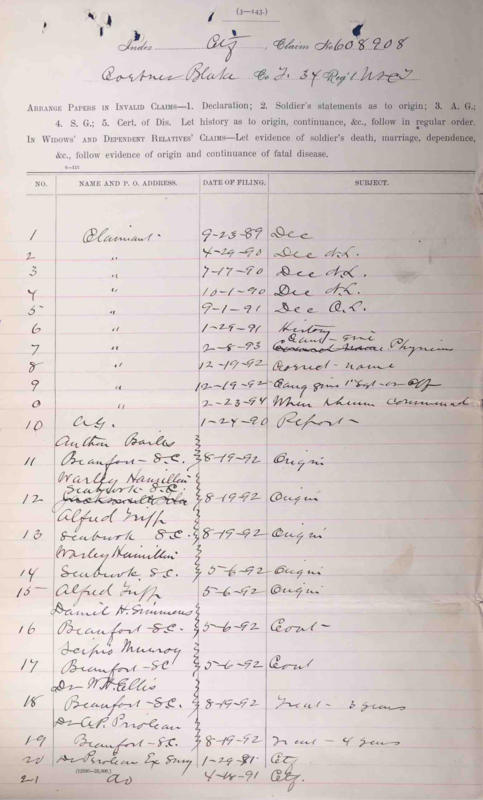 Summary of statement of Alexander Johnson, 27 November 1895: Alexander Johnson was about 42 years of age and lived five miles from Beaufort. He served in Company F, 34th USCT. He mustered in at Pigeon Point and mustered out at Mt. Pleasant, SC as a sergeant. He served as a volunteer and met Corbner Blake in Company F. He knew him to be a recruit who was made a corporal. He did not know him before the service and has known him ever since discharge under the name of Corbner Francis, the very same man who served under the name of Corbner Blake. He did not know if Corbner was wounded or injured during service. He seemed to be all right when he joined and when he mustered out. He never saw Corbner in the hospital and did not know of any sickness he had while in the army. He had seen Corbner now and then and had only been to his house one time. He never worked with Corbner and never heard him complain of anything. He never knew Corbner to have rheumatism. He stated they were only friends. Summary of statement of Scipio Murray alias Brown, 15 November 1895: Scipio Murray, AKA Scipio Brown, was 49 years old and a carpenter. He was also a disabled sailor. He lived in Beaufort, SC. He and Corbner belonged to cousins in slavery times. Corbner belonged to Walter Blake and Scipio belonged to Otter [Arthur] Blake. Scipio was raised in the Georgetown District. He did not know Corbner until a few weeks before Corbner enlisted in the army. Scipio was an enlisted man on the Revenuer Cutters Nemehon and Harriet Weed. He was on the latter boat when the federals brought Corbner and others down from the Blake Plantation. Scipio stayed in the navy but he knew and saw Corbner after he became a soldier and he knew Corbner enlisted under the name of Blake. He had been to Corbner’s house and knew he was a man who suffered with pain in the back and rheumatism. He looked at Corbner, at the time of the deposition, as an old man and a disabled man. He had never worked with Corbner but he saw him off and on in Beaufort. Summary of statement of Corbner Blake, 13 November 1895: Corbner Blake was 72 years old at the time of his deposition, and a disabled soldier. He lived near Seabrook, ten miles from Beaufort, SC. He served as a private and then a corporal in Capt. Jno M. Adams’ Company F, 34th USCT, Col. Montgomery’s regiment. He enlisted at Hilton Head, SC on 3 July 1863 and mustered out at Mt. Pleasant, SC near Charleston on 28 February 1866. He was a slave of Walter Blake and was born at Combahee on his plantation. He grew up healthy and hearty. He reported that Mr. Blake took good care of his slaves. He always lived with Mr. Blake before enlistment and was a bricklayer and plasterer. He stated was never abused much. Billy Singleton and Old Tommy at Combahee were raised with him. Russell Fields also knew him. When he enlisted, he was a recruiter in charge of filling up the companies with Capt. Bryant and then with Capt. Adams. That was when he received his corporal’s stripe. As a corporal, he had to wade through water to visit the picket posts. He was on for 24 hours and had to relieve the men on the posts every hour. He caught cold and was laid up for two days with Capt. Adams himself attending to him. He was never in any hospital during the service. He did have a lump in his groin that he showed to Capt. Adams. A doctor was with the company then, an “old stiff white gentleman.” The doctor gave him something to scatter the swelling one Saturday and he was able to be on dress parade on Sunday. He was the tallest man in the company and Capt. Adams was the oldest captain. Daniel Simmons was his tent and bunk mate and he knew Corbner’s condition. He did not feel well at discharge and in about one year, began to feel pains in his sides and shoulders. He lived at Beaufort and had done farming work. He did not feel bad the first year after discharge. He stated that Warney Hamilton could prove that he had great exposure in the army. Alfred Fripp also knew his condition in the army and afterwards. He reported his old age had partly caused his condition and that he never had any more exposure than the other corporals in his company during the service. He said that once he had his cap shot off his head but he was not hit. He stated his left knee gave him big trouble and that it was weaker than it had been but he had never injured it. His right knee was worse. He never got hit on the knees nor did he fall off of anything. He reported he could not ride a horse for any distance. He did walk to Beaufort but not in any hurry. He was unable to work in the field very much. His family ran what crop he did plant. He also said that Toby Taylor and Antony Bailey knew of his condition because he used to put them on post. Summary of statement of S.J. Bampfield, Clerk of the Circuit Court, 17 September 1889: Corbner Blake was enrolled as a corporal on 3 July 1863 in Company F, 33rd Regiment of USCT commanded by Capt. John M. Adams and was honorably discharged at Jacksonville, FL on 28 February 1866. At the time of the deposition he was 66 years old, 6-feet tall, with dark complexion, black hair, and dark eyes. While serving at Fort Pulaski, GA about October 1864, he contracted rheumatism from cold and exposure and that disease had continued to be a serious cause of disability. He was not treated by the Regimental Surgeon. His occupation had been that of a bricklayer. Prior to his entry in the service, he was a farmer. 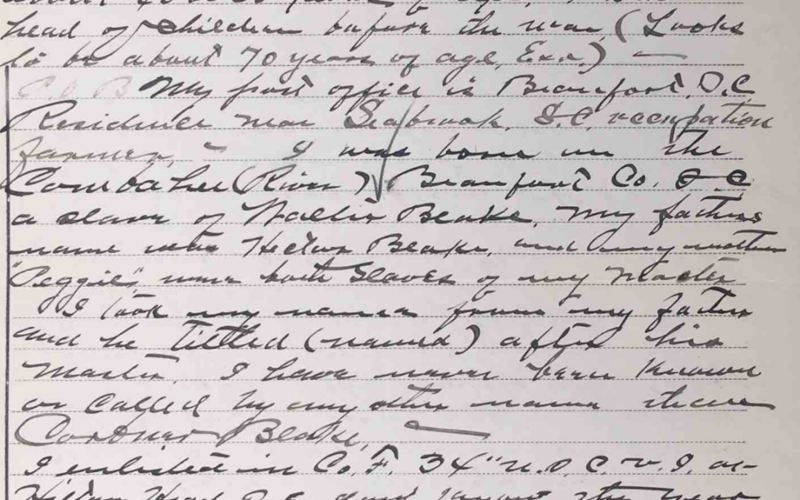 Summary of statement of Corbner Blake, 26 June 1902: He was about 40 or 50 years old [Note of examiner in parentheses stated he looks to be about 70 years of age]. He reported his residence to be near Seabrook, SC. His occupation was that of a farmer. Both his parents were slaves of his master. He took his name from his fathers’ and he titled (named) after his master, Walter Blake. He had never been known or called by any name other than Corbner Blake. He reported he was never injured or wounded in the service and was never in any hospital. He was not in the U.S. Navy or Confederate service. His colonel was Montgomery, his captain was Adams, and his sergeant was Charlie Gabriel. He was in battle at Morris Island and Honey Hill, SC and at Jacksonville, FL. Isaac Williams and Monday Hamilton were his tent mates. Summary of statement of Corbner Blake, 17 May 1892: His true and correct name was Corbner Blake. Blake was his former master and Corbner enlisted under that name. He enlisted on 3 July 1863 in Company F, 34th Regiment and was discharged 28 February 1866. He was born on Combahee, Colleton County, SC. Francis was only a nickname by which he was called. Summary of statement of Corbner Blake, 7 December 1892: He was unable to furnish evidence of Orderly Sergt. Charles Gabriel or of any Com. Officers or of Surgeon because Orderly Sergeant Charles Gabriel died at Key West, FL while in the service and Joseph Richardson, the next Orderly Sergeant, died at Beaufort, SC some years prior to the deposition. He knew that two of his commissioned officers were dead and that he did not know the whereabouts of the others or if they were living or dead, nor did he know the surgeon’s whereabout or if he were living or dead. Summary of statement of Corbner Blake, 21 February 1894: He began to be troubled with rheumatism about six months after discharge. He had a heavy cold when he mustered out which settled into rheumatism. He went to Dr. Gibbes for treatment off and on until the doctor died. The rheumatism increased from year to year and he could, at the time of the deposition, do but very little work and, when the weather was bad or cloudy, was laid up. Summary of statement of Corbner Blake, 8 July 1890: He reported he was the identical Corbner Blake who was a corporal in Company F of the 34th Regiment USCT. He enrolled at Hilton Head, SC on 3 July 1863 and was honorably discharged at Jacksonville, FL on 28 February 1866. He was born in 1823. He reported being 2/3 disabled because of rheumatism and had resided at Seabrook, SC, working as a farmer, since his discharge from service. Prior to his military service, he was a bricklayer. Also at the deposition were Toby Taylor and Jacob Adkins of Beaufort who stated they had known Corbner Blake for 27 and 28 years respectively. Summary of statement of Cubner Francis (aka Corbner Blake), 21 January 1891: He was 64 years old and a resident of Seabrook, Beaufort County, SC. He enlisted on 3 July 1861 and resided in the following places: Blake plantation, Combahee, SC and was known by the name of Corbner Blake. His occupation was that of a bricklayer. He was a corporal in Company F, 34th USCT. He was discharged on 28 February 1866 and at the time of his deposition was working as a farmer. He reported to have rheumatism on the right side from working in the Florida swamps during the service. He had seen Dr. Gibbes for treatment and got medicine. He reported that he gets worse every year. Summary of statement of Corbner Blake, 28 August 189[not completed]: He was 67 years old and a resident of the Springfield Plantation, Port Royal Island, Beaufort County, SC. He enrolled on 3 July 1863 in Company F, 34th Regiment, USCT as a corporal. He was honorably discharged at Jacksonville, FL on 28 February 1866. He stated he was unable to earn support because of rheumatism in the right leg, arm, and side. Also appearing were Richard Howard who lived at Port Royal Island, and William McNeil who lived at Beaufort. They each knew Corbner Blake for 30 years. Summary of statement of Corbner Blake, 18 August 1891: He enrolled in Company F, 34th Regiment USCT in June 1863. The company was commanded by Capt. Adams. He was honorably discharged on 28 February 1866 in Mt. Pleasant, SC. He was described as being 5-feet 4-inches with dark complexion, hair and eyes. He contracted rheumatism while a member of the company aforementioned at Jacksonville, FL. He was on picket duty one rainy night and took cold. They next day his right side and leg were numb. He was given some medicine by his captain, stayed in his quarters, and did not go to a hospital. He stayed in his tent. He has had the rheumatism ever since and it continued to get worse. He had been working as a farmer since being discharged. Before enlisting, he was a bricklayer. Also appearing were William McNeal of Beaufort, SC and A.Z. Colonel, also of Beaufort. Summary of statement of Antone Bailey, 13 June 1890: He knew Corbner Blake in the service because they were members of the same company. He knew Corbner Blake contracted rheumatism at Jacksonville, FL in the early part of 1864 or about that time. He had rheumatism when he was discharged. At the time of the deposition, he saw Corbner Blake almost every month since discharge and he knew him to still suffer from rheumatism. He judged him to lose 1/3 of his time from manual labor on account of rheumatism. Summary of statement of Alfred Fripp, [Undated]: Alfred Fripp stated that Corbner’s rheumatism was caused by continued exposure in the camps. Prior to going into the hospital, Corbner Blake had been on duty 24 hours without being relieved and this was while suffering from his ailment. The rheumatism was not cured while Corbner Blake was in the army and not since he had been discharged. Summary of statement of Alfred Fripp, 9 February 1894: He and Corbner Blake were neighbors. He knew Corbner to be afflicted and down in bed for weeks and months with the pain in his back and shoulder. Summary of statement of Daniel H. Simmons, 14 December 1891: Daniel Simmons stated that he had known Corbner Blake since 1862. They served in the same regiment and company. Daniel had seen Corbner two to three times each week ever since they mustered out. He had always conversed with him and knew that Corbner had been disabled from rheumatism since his discharge from the army. Summary of statement of Daniel H. Simmons, [Undated]: He always knew Corbner Blake to answer Roll Call at the name Corbner Blake in Company F, 34th Regiment, USCT. He was made a corporal in the company with Capt. John Adams in command. Summary of statement of Scipio Murray, 14 December 1891: Scipio Murray stated that he had known Corbner Blake before Corbner went into the army. He had seen him every week, more or less, since Corbner was discharged. Every time they conversed, Corbner complained of his rheumatism. About three years prior to the deposition, Scipio visited Corbner’s house and found him sick and in bed from an attack of rheumatism. Summary of statement of Scipio Murray, 31 January 1894: The first time he saw Corbner Blake was in 1865. He had seen him every two or three months since Corbner’s discharge. He knew Corbner was scarcely able to move sometimes because of the rheumatism. Summary of statement of S.J. Bampfield, Clerk of the Circuit Court, 21 April 1890: Corbner Blake declared that he was the identical Cubner Francis who was a corporal in Company F, 34th Regiment USCT. He was enrolled in the company at Hilton Head, SC in October 1852 and honorably discharged at Mt. Pleasant, SC in 1865. At the time of the statement, he was about 40 years old, 6 feet tall, with dark complexion, hair, and eyes. While in Florida during the winter of 1862 and 1863, he contracted rheumatism caused by the exposure, hardships, and privations of army life. His said rheumatism had greatly disabled him ever since that time from the performance of manual labor. Pool Sellers and Alfred Fripp of Seabrook, Beaufort County, SC also appeared at the deposition and reported they each knew Corbner Blake for 30 years. Summary of statement of W.H. Ellis, MD, 28 May 1890: Dr. William Ellis prescribed treatment for rheumatism for the right hip and leg. During cloudy, cold or damp weather motion of the right arm and leg were so painful that Corbner Blake was unable to perform any manual labor. He was adjudged to be unable to perform manual labor about ½ of the time. Summary of statement of A.P. Prioleau, 17 May [Illegible]: He has prescribed occasionally and sold Corbner Blake medicine for rheumatism. He reported a small scar on the right knee with the patella freely moveable, both joints were prominent, and there was some stiffness in the joints with limitation of motion by ¼. The right knee was weak and Corbner Blake was deemed unable to perform sustained manual labor though he was not totally incapacitated. Summary of report of Arthur Prioleau, MD, 15 April 1891: Dr. Arthur Prioleau reported Corbner Blake to be 5-feet 8-inches tall, 142 lbs., and 60 years of age. He was examined on 21 July 1891 under the name of Cubner Francis. His heart sounds were normal. There was a small scar on the right knee but the patella was freely moveable. Both knee joints were enlarged and there was stiffness though no considerable limitation of motion. The left knee joint was much larger in circumference than the right. There were no further disabilities found nor did the doctor suspect vicious habits. 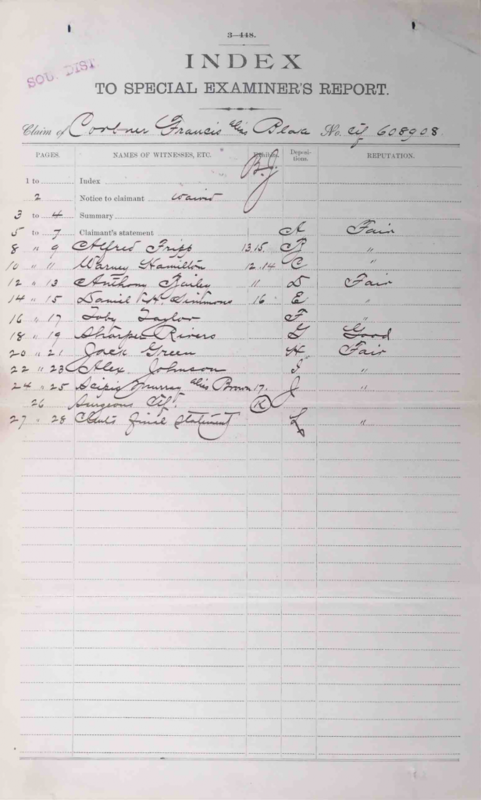 Summary of evidence of Dr. A.S. Gibbs, 26 January 1893: Dr. A.S. Gibbs treated Corbner Blake for his disabilities soon after he returned home from the service. The doctor died 11 August 1885. 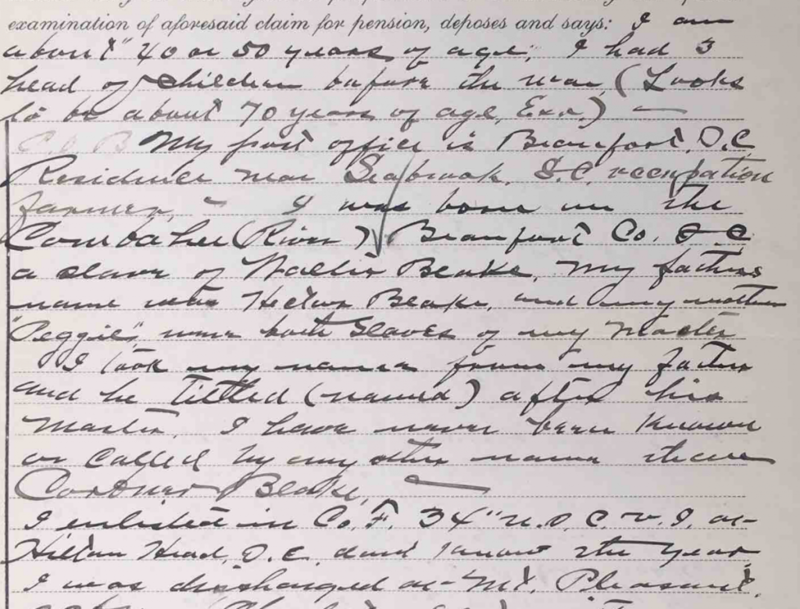 Summary of statement of Warney Hamilton, 14 November 1895: He did not know his age and thought it was about 55 or 60. He lived at Seabrook, SC. He served as a corporal in Capt. Adams’ Company F, 34th USCT, enlisted at Beaufort and mustering out at Mt. Pleasant near Charleston, SC with the company. He knew Corbner Blake before the service. Corbner belonged to Blake and Warney belonged to Trescott. Warney said he used to go to the Blake place and he knew Corbner well. He was a prime man in the days before the War. Warney enlisted a month or two before Corbner did. He remembered Corbner being troubled with a pain in the back at Morris Island, about two years after he enlisted. He knew Corbner was sick in the hospital with the same back ache at Morris Island. Corbner was also sick at Jacksonville, FL before the Morris Island sickness. His trouble was always in his back in the army and it stuck with him until the present time. He lived close to Corbner after mustering out and they testified on each other’s claims. He knew Corbner could not do much work prior to this deposition and he sometimes complained of his shoulders also hurting. At discharge, Corbner was poorly. They went home together after mustering out. Summary of statement of Toby Taylor, 9 March 1897: He belonged to the same company and regiment that Corbner Blake did. They were stationed at Morris Island (near Charleston) and Jacksonville, FL where Corbner contracted rheumatism on account of continued exposure, doing duty as a picket, frequently being compelled to remain a whole day in wet clothes. Summary of statement of Jones Campbell, 9 March 1897: Jones Campbell stated that he was a member of Company F, 34th USCT and, during 1864, was stationed on Morris near Charleston and Jacksonville, FL. Corbner Blake was also a member of the company. Jones was with Corbner constantly and knew that he contracted rheumatism from constant exposure to all kinds of weather because of being on picket duty. Summary of statement of Daniel Wright, 24 August 1897: Daniel Wright stated that he was well acquainted with Corbner Blake since a year after Corbner came out of the army. He was a neighbor and could state as a fact that Corbner was suffering with rheumatism every year, to the point where he was scarcely able to do any laborious work. Summary of statement of Richard Howard, 24 August 1897: Richard Howard was 53 years of age at the time of his deposition. He became acquainted with Corbner Blake at the time he returned from the army in 1866. At that time he was suffering from rheumatism. Richard was Corbner’s neighbor and knew that Corbner was able to scarcely do any work. Being situated where he was, he said he would have know if Corbner had been able to work. Summary of statement of Corbner Blake, 15 December 1903: He was a corporal in Company F, 34th Regiment USCT, enlisting on 3 July 1863 and being discharged on 28 February 1866. He believed his pension should be increased because of general debility and debility due to age. He had pain in his knees and his eyesight was failing. Also appearing were Robert Calvert and Benjamin Murray of Beaufort, SC. Summary of statement of T.O. Hutson, MD 1 February 1904: Corbner Blake was suffering from commencing double cataract (senile) that was affecting the sight of both eyes. He was also suffering from general rheumatism and it did not appear that his troubles were due to vicious habits. He was considered about 7/8 incapacitated from performing manual labor. Summary of statements of doctors H.M. Stuart, N.J. Kennedy, and C.M. Griffin, 17 February 1904: Corbner Blake was born at Colleton County, SC. He was about 75 years of age, 5’10”, 135 lbs., black complexion and eyes, gray hair, and he was a farmer. There were no problems with his lungs or heart. He complained of rheumatism affecting his shoulders, hips, and legs and there was stiffness and thickening of the fibrous structures with crepitus on enforced motion of the shoulders. There was stiffness in all the joints mentioned with muscle wasting in the gluteal region. Limitation of motion was equal to ¼. There were no muscle contractures. He was reported to suffer with general and senile debility due to his age and the aforementioned disabilities. He was found to suffer from debility not due to vicious habits and was warranted at a rate of ten dollars per month. Summary of statement of Corbner Blake, 15 June 1904: He was a member of Company F, 34th Regiment USCT Volunteers. He was a resident of Seabrook Station, Beaufort County, SC. He had been receiving $6 per month and believed he was entitled to an increase in his pension due to rheumatism in both knees, pain in the back, and being short of sight. He was born in 1823. Also appearing were Anthony Bailey and Benjamin Polite of Beaufort, SC. They had each known Corbner Blake for 41 years. Summary of statement of D.W. Bythewood, Notary Public, 26 February 1907: Corbner Blake was enrolled on 3 July 1863 in Company F., 34th USCT in the Civil War and served at least 90 days. He was honorably discharged on 28 February 1866 at Jacksonville, FL. He was over 75 years old – his discharge papers made him 84 years old. Corbner Blake asked for a pension of $20 per month. Summary of statement of Corbner Blake, 4 May 1908: He was married to Julia Blake about 1855 by Daniel Blake in Beaufort, SC. He was not previously married. He had one living child, Phillis Gillison, born about 1857. Summary of statement of Hannah Blake, 15 February 1909: In her deposition, Hannah Blake stated that she was 55 years old and a resident of Beaufort, Beaufort County, SC. She was the widow of Corbner Blake. She knew the last payment of his pension was 4 August 1908 and he died on 24 August 1908. She was married under the name of Hannah Frances to Corbner Blake on 24 April 1908 by Rev. Jos. Frazier. She had been previously married to Brister Stewart who died at Seabrook, SC on 27 July 1904. Corbner’s former wife, Julia, died at Seabrook, SC in October 1907. Summary of statement of Hannah Blake, 12 April 1909: She reported that no record of the death of Corbner Blake existed except the record at the National Cemetery in Beaufort, SC. There was no record of her marriage to the soldier. Her first husband was Thomas Rivers who died in the Beaufort County poor house about three years before the storm of 1893. Her second husband was Brister Stewart who died about seven years prior to the deposition and was buried at Seabrook, SC. Brister Stewart never served in the military or naval services of the United States. She had never applied for a pension as the widow of Brister Stewart. Summary of statement of Toby Smalls, 12 April 1909: Toby Smalls stated that he had been acquainted with Hannah Blake all of his life. Hannah and Corbner had lived together from the date of her marriage until his death. She had been previously married to Thomas Rivers and Brister Stewart, both of whom were dead. Julia was the only wife Corbner had except for Hannah. Julia, Corbner’s former wife, died in October 1907 at Seabrook, SC. Brister Stewart died about seven years prior to the deposition at Seabrook, SC. Summary of statement of Joseph Frasier, 4 June 1909: Joseph Frasier was 57 years old and a resident of Magnolia, Beaufort County, SC. He was a regularly ordained Methodist minister and, on 22 May 1908 married Cubner Blake. He said he knew Cubner Blake and his wife at least 35 years.